PROTESTS against arms traders seem to result in a crop of members being detained by police - apparently contrary to the guidelines issued to officers by the Met. 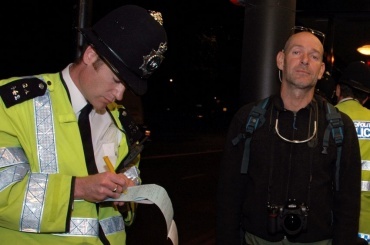 Above we see Mike Wells being stopped under the Terrorism Act 2000 outside the Dorchester Hotel, where arms traders were dining on 13 September. Another member, on showing their press card, was looked up and told, wrongly, that they'd been arrested at the equivalent protest in 2005. We're following up reports of other detentions - and of police Forward Intelligence Teams carrying a "bingo card" of people to stop, on which independent journalists may appear.